(MP013). W L Wyllie (1851-1931). Etching (annotated by the artist proof copy); signed by WL Wyllie. Standard size (which is half original size): 15.5 x 8.75 ins (39.3x 22.1 cms) approx. It was the evening of 6th May 1910 when King Edward VII died and King George V succeeded to the throne  here the Royal Navy is seen paying its first formal tribute to the new King. 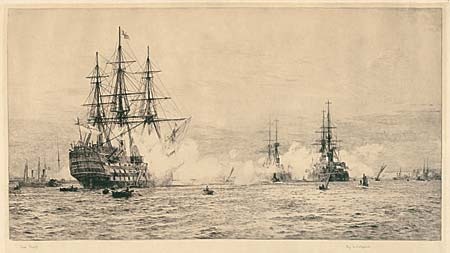 Wyllie’s celebrated etching (this one is captioned by the artist trial proof’) shows Portsmouth harbour looking towards the north, and HMS VICTORY wearing the flag of the Commander-in-Chief Portsmouth, Admiral The Hon Sir Assheton Curzon-Howe GCVO KCB CMG, wreathed in smoke as a Royal Salute roars out. It is almost certainly the morning following the late King’s death and together with VICTORY (Captain J de M Hutchison CVO CMG RN) out in the harbour are moored, in the foreground, the old battleship HMS REVENGE (Captain Ronald Hopwood RN) with ahead of her up harbour, the new dreadnought HMS SUPERB (Captain F C T Tudor RN. On either side of the main players is an assortment of craft including the submarine to the right seen coming down harbour: she is thought to be an A Class boat. It was Captain Hopwood's doggerel Our Fathers’ and Laws of the Navy’ around which Wyllie and Rowland Langmaid respectively based their famous sets of etchings (and which are available on this website).